Red Deadnettle, Purple Deadnettle, Archangel, Bee Nettle (Lamium purpureum) is a herbaceous flowering plant. A member of the Mint Family, the plant accordingly has the characteristic four-sided square stem and the crushed leaves a sharp, pungent scent. The plant is a short-lived annual, but seeds can germinate at any time of the year, including during spells of mild weather in winter. A short, spreading plant that usually reaches from 5cm to 20cms tall, very occasionally to 30cms, that produces several square, upright stems and opposite leaves. The lowest leaves are very small with long stalks; higher leaves are larger, held on short stalks and become heart-shaped with wavy to serrated margins. Stems and leaves are often flushed with purple. The flowers are bright red-purple and arranged in whorls often up to ten individuals around the axis of the stem. Each flower has a top hood-like petal, two lower lip petal lobes and minute fang-like lobes between. Found growing on cultivated land, including gardens, roadsides and waste ground, Red Deadnettle is generally considered to be a weed, as it is an undesired and uncultivated plant. 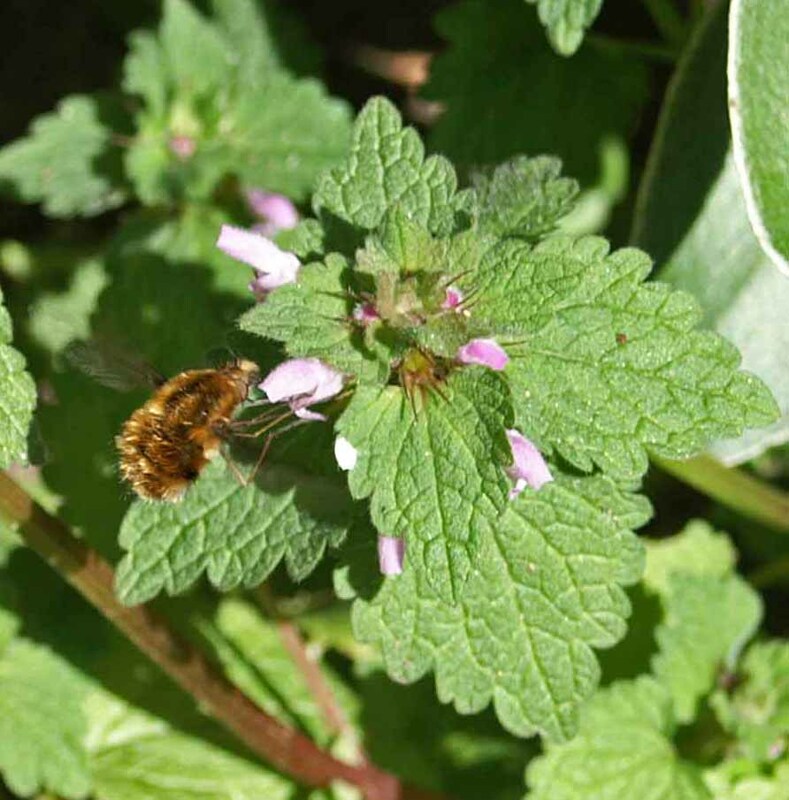 A true native of the Mediterranean basin, comprising Europe, North Africa and Western Asia, it is likely that its introduction into Britain coincided with that of early agriculture; evidence of red dead-nettle has been found in Bronze Age deposits. It is likely to have been similarly introduced to North America, where the plant is regarded as an invasive weed. The early production of flowers allows bees to gather its nectar for food when few other nectar sources are available. It is also a prominent source of pollen for bees in March/April when the insects need the pollen as protein to build up their nests. 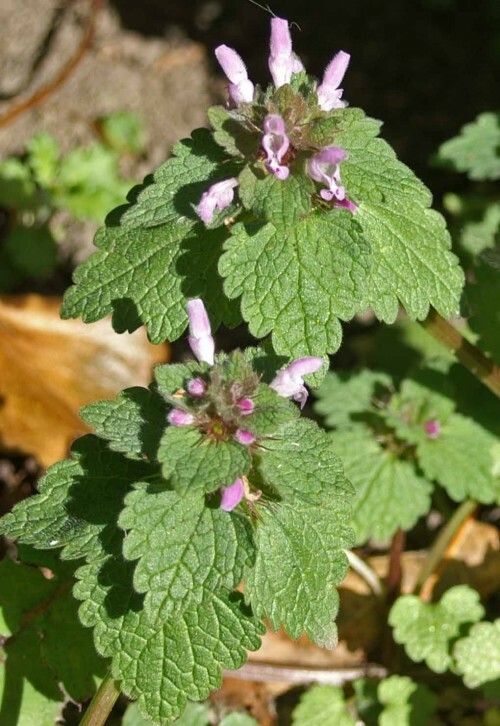 Although the plant is superficially similar to a stinging nettle in appearance, it is not related and does not sting, hence the name “deadnettle”. The plant commonly flowers in April and the alternative name ‘Archangel’ refers to this traditional first appearance. May 8th is dedicated to the Archangel Michel, which historically was 11 days earlier on April 27, prior to the Gregorian calendar change of 1582 (which took until 1752 to change in Great Britain). 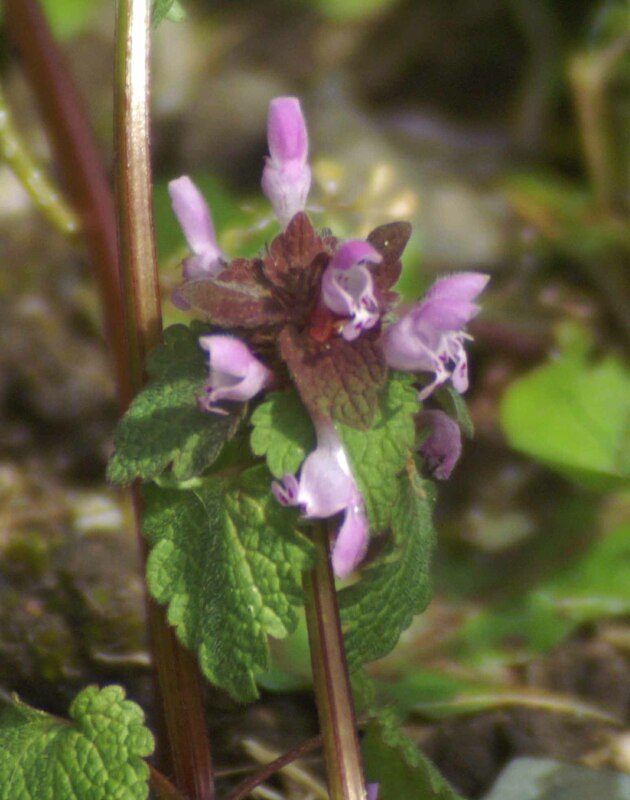 Scientific Name: Lamium purpureum – The generic name is from the Greek lamia which means ‘devouring monster’ in reference to the galeate, or helmet shape of the flower which has the general appearance of open jaws. An alternative etymology is that Lamium is derived from the Greek lamios, meaning ‘thread’; the corolla of the flower is “threaded” through the lips. The species name is from purpureus, the Latin word for purple. The whole plant is astringent, diaphoretic, diuretic, purgative and styptic. The dried leaves have been used as a poultice to stem hemorrhaging whilst the fresh bruised leaves can be applied to external cuts and wounds. The leaves may also be made into a tea and drunk to promote perspiration and discharge from the kidneys in the treatment of chills.